Thanksgiving is a time to give thanks for all the wonderful things we have. We might give a little toast to express this or do a Facebook "I'm thankful for" post challenge - but for many of us that's as far as it goes. It's not that we're not grateful for what we have, it's that we just don't have the time to sit back and reflect and express it thoroughly. With all the cooking and planning and traveling - it just gets so hectic. 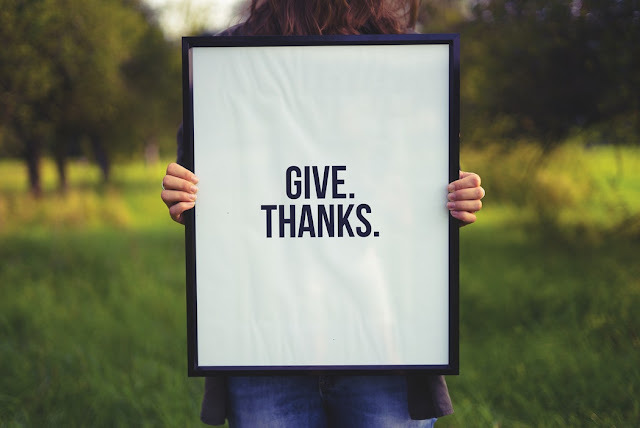 Check out these 12 things to do if you'd like to do something a little more effective than awkwardly muttering what you're thankful at the dinner table. Show your gratitude by sharing what you have with others who are less fortunate. 1. Participate in or host a food drive for your local food pantry. Present the idea to your boss at work or to members of a club or organization you belong to. 2. Donate your unwanted clothes, toys, furniture and other items to a charity shop. Thrift shops need extra merchandise during the holidays to support the high traffic Christmas shopping brings so I'm sure they'll be more than happy to take your donations. 3. Send care packages to soldiers overseas. Be sure to include a Thanksgiving card, a photo of your family or even a cute little drawing or craft done by your child. Can't go wrong with a classic hand-turkey! Click HERE to see what else to include and where to mail the package. Need bulk items for multiple packages? Try shopping the Dollar Tree online. 4. Order groceries to be delivered to a family in need or buy them yourself and drop them off to avoid delivery fees. 5. Have a Thanksgiving bake sale and donate the money to a local Charity. People don't mind charities and people love Thanksgiving shortcuts so this one is a total win. 6. Organize a group to go sing at a nursing home. If you're in a choir, you're already halfway there. You don't need a large group, a trio will suffice. Many elderly people are Christians, so old traditional hymns would be great for them to hear and sing along to. 7. Give out care-packages to homeless people on the street. Not sure how to make one? Click HERE to see what to include. By the way, socks and underwear are what homeless people need the most and but those items always get overlooked while donating, so I'm sure a pair will be greatly appreciated. 8. Volunteer at a soup kitchen or any free Thanksgiving meal event. 9. Participate in a Thanksgiving 5K. They're often called "Turkey Trots" and are held to raise money for a local charity. I'm sure there will be one going on somewhere near you on or before Thanksgiving. 10. Invite a family in need or individual to join you for Thanksgiving dinner. Think of someone from your job, school or favorite hang out spot might need a little extra love during the holidays. 11. Bake cookies , a large cake or make goody bags for law enforcement and other community servicemen working on Thanksgiving. Just simply deliver the items to their station at any time. 12. Dining out on Thanksgiving? Pay for someone's meal who is dining alone. Just ask your server for their bill and inform him/her that you'd like to cover the cost. It's perfectly ok to ask to remain anonymous! Do you do any of these things at Thanksgiving time? Tell me all about it in a comment below!